Obesity is a strong risk factor for endometrial cancer, but it is unclear whether metabolic syndrome (MetS) contributes to endometrial cancer risk over and above the contribution of obesity. We examined the association of MetS and its components with risk of endometrial cancer in a sub-cohort of 24,210 women enrolled in the Women’s Health Initiative cohort study. Two variants of the National Cholesterol Education Program Adult Treatment Panel III definition of the MetS were used: one including and one excluding waist circumference (WC). Cox proportional hazards models were used to estimate the association of the study exposures with disease risk. 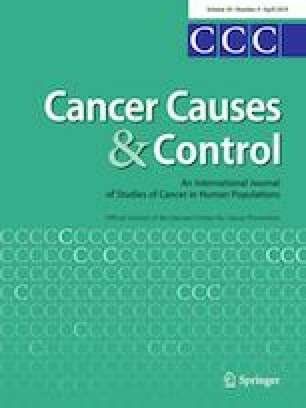 When WC was included in the definition, MetS showed an approximately two-fold increase in endometrial cancer risk (HR 2.20; 95% CI 1.61–3.02); however, when WC was excluded, MetS was no longer associated with risk. We also observed that women with hyperglycemia, dyslipidemia and hypertension, in combination, had almost a twofold increased risk of endometrial cancer, independent of WC (HR 1.94; 95% CI 1.09, 3.46). Glucose, and, in particular, WC and body mass index were also positively associated with risk. Our findings suggest that MetS may predict risk of endometrial cancer independent of obesity among women with the remaining four Mets components. Rhonda Arthur and Geoffrey C. Kabat have equal contribution. The online version of this article ( https://doi.org/10.1007/s10552-019-01139-5) contains supplementary material, which is available to authorized users. Conception and design: TER, GCK, RA; Development of methodology: GCK, TER, RA; Acquisition of data: GCK; Analysis and interpretation of data (e.g., statistical analysis, biostatistics, computational analysis): GCK, TER, RA, MYK; Writing, review, and/or revision of the manuscript: GCK, TER, RA, MYK, RAW, AHS, JW-W, GYFH, KWR, LHK, JL, JB-D, MSS, HS, SW-S. This work was supported by institutional funds from the Albert Einstein College of Medicine.